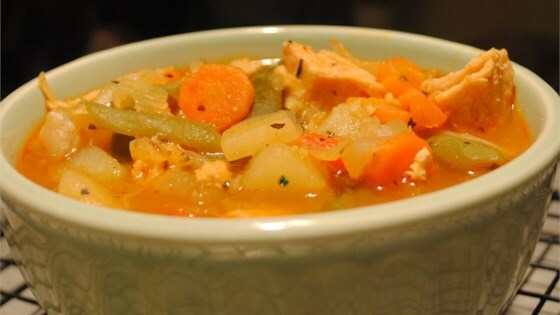 "This is a delicious and simple recipe for chicken vegetable soup. All you have to do is combine everything in a pot and let it simmer. It's quite good and good for you." In a large pot over high heat, combine the chicken broth, cabbage, carrots, potatoes, onion, green beans, green bell pepper, tomato juice, garlic, oregano, basil and Italian-style seasoning. Bring to a boil, reduce heat to low and simmer for 1 hour, or until all vegetables are tender. Add the chicken and simmer for 15 more minutes. Season with salt and pepper to taste. There was nowhere near enough juices, I could tell from the recipe so I even added a little extra broth, it turned out like a stew, a very dry stew. I thought this recipe was terrible and I threw 80% of it away. I had to add more broth than called for and it has way too much basil and Italian seasoning in it. Will not make again! This soup was delicious, but I think the recipe is wrong. I used 1 litre (4 cups) of V8 vegetable juice, as well as the broth. Any less, and there would not have been enough liquid.